Fine Cell Work is a charity with the aim of rehabilitation of prisoners through stitch. Volunteers go into prisons and teach inmates how to stitch. This not only gives prisoners something fill the long hours of confinement and a way of making some money in prison, but can be life changing as it can give the stitcher hope, discipline and self belief, which can greatly improve their job prospects upon release. 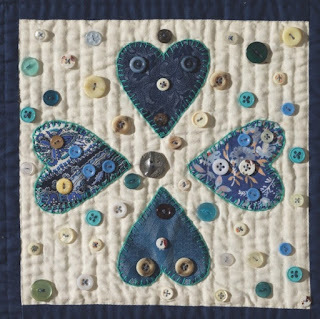 The author, Tracy Chevalier, became very interested in quilting when she was researching one of her books and is still involved in it today. She commissioned this quilt and has written an essay in the accompanying book. 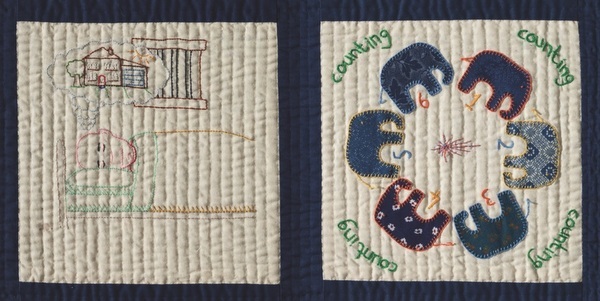 The quilt comprises of 63 squares, each stitched by an inmate who works with Fine Cell Work, giving their interpretation of what sleep means to them. 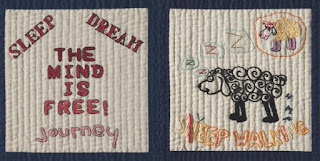 Whilst it is always interesting to discover how different people interpret the same theme, such as the Bedtime Stories Quilt, which I wrote about here, this quilt is fascinating as it gives an insight into the lives of people we do not normally consider. Sleep is something we all need, sometimes it comes easily, other times it is something elusive and it has a massive impact on our lives. Prison makes sleep harder due to the inescapable noisy and crowded environment, which gives the interpretations an added poignancy. 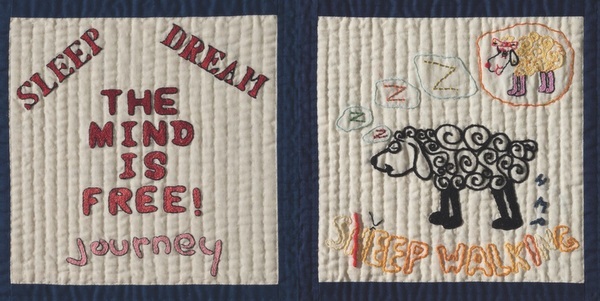 This book, which accompanies the Sleep Quilt, has lovely details of all the blocks, along with details of what inspired the maker and the impact of making on them. It is available from 31 October 2017 and until 16 November 2017, it is being crowdfunded through Kickstarter, so additional benefits are available through this scheme. All royalties from the book will go to Fine Cell Work.